Any time a new bike lane goes in, you’re guaranteed to hear this question: What will we do when it snows? BicyclesOnly answered this question rather well after the last blizzard, since it was cars, buses, taxis, trucks, and delivery vehicles that were stranded on city streets, and not bikes. This question, like so much of the criticism of bike lanes, is nothing more than a distraction, designed to sow doubt about traffic calming projects that, bikes or not, make things safer for everyone. It also takes away from the real problem during snow events: cars. So, now that we’ve had another blizzard, what will we do with cars when it snows? The only incentive a driver has to shovel out his car early is so that it doesn’t get iced over. While crosswalks and intersections remain snow-covered with just foot-wide troughs in the snow for walking, car owners get their own huge parking space in which to let their private vehicles linger for as long as the city keeps alternate side parking suspended. The convenience of the few outweighs the slow walking and wet feet of the many. So, while critics might bemoan that bike riders are getting an expensive service for free and aren’t even using it–as if anyone could be expected to use a bike lane that’s not plowed for three days–it’s car ownership that truly proves the ways in which the needs of a privileged minority are given priority over the majority. The entire cost of the bike lane network in New York City does not even come close to adding up to the amount of money the city could receive it charged people for the privilege of leaving their cars like this for days and days on end. 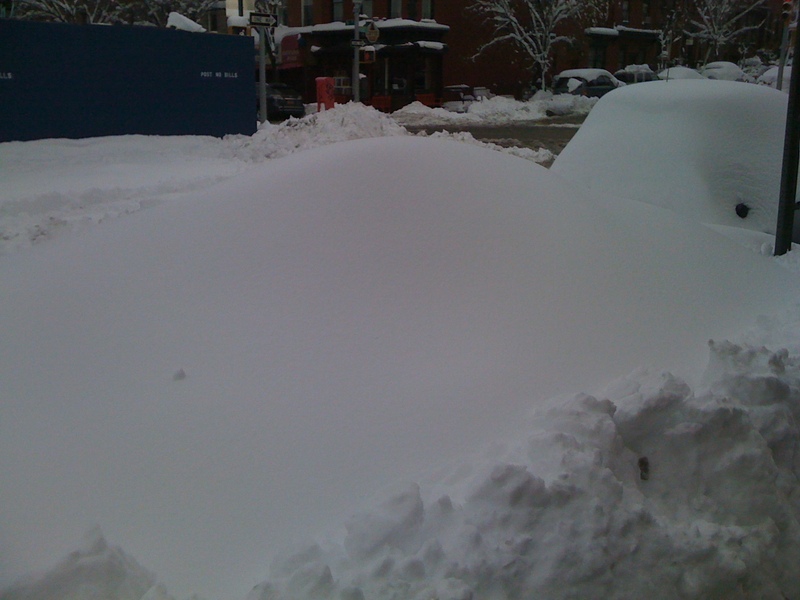 There's a car under there.